Sound masking systems (sometimes referred to as white noise systems) reduce distractions and improve speech privacy, especially in open-plan office areas. When designed properly, occupants don’t even notice the masking system is there. Through an array of loudspeakers or emitters, pink noise or white noise is emitted into the space. This raises the overall noise floor. For intelligible speech, that noise floor must be overcome, which means less unintentional eavesdropping, thereby reducing distractions. Masking also makes intentional eaves-dropping more difficult, thereby improving speech privacy. Occupants are likely to be more comfortable and more productive in open-plan office designs with sound masking systems. These systems can even be used for paging systems in some circumstances. We would love to schedule a visit with you to experience the system we use in our own office! Corporate environments are a common place to find sound masking systems. 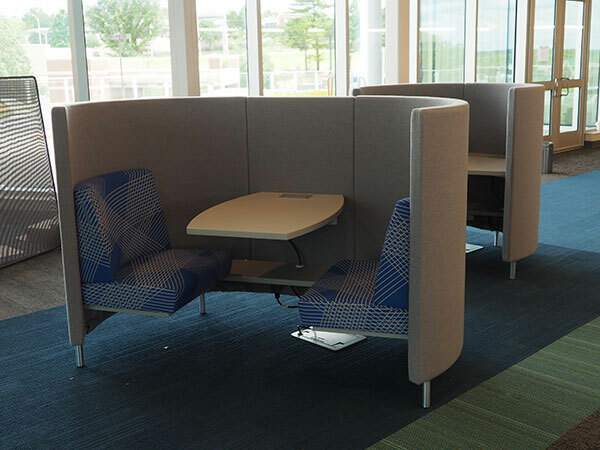 These systems have the ability to both improve speech privacy and improve staff comfort and productivity. Open-office-plan designs, in particular, are likely candidates for sound masking. Let AVANT ACOUSTICS help create a better workplace for you with masking technology. Government facilities are often require complete noise isolation and privacy in conversation. Sensitive compartmented information facilities (SCIFs) are one extreme example where sound masking can contribute to speech privacy. Beyond that, however, open floor plan layouts benefit from sound masking by reducing the brain’s focus on annoying background noise and distracting conversations. A well-designed sound masking system often improves both staff comfort and productivity. HIPAA compliance is often a major concern for healthcare facilities. Architectural acoustics and noise isolation are important first steps, but sound masking can supplement the physical barriers. 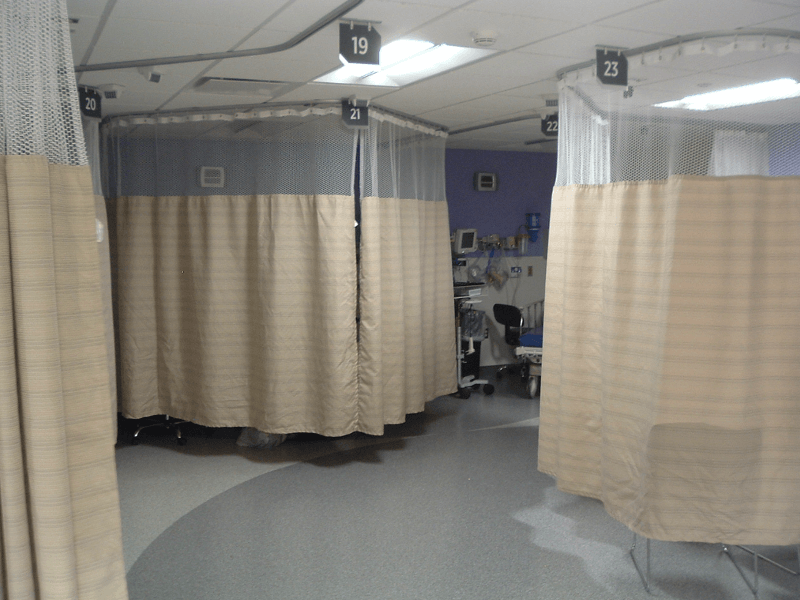 In fact, sound masking may be the only option in the reception area where patients are in close proximity to one another with no demising partitions at all. 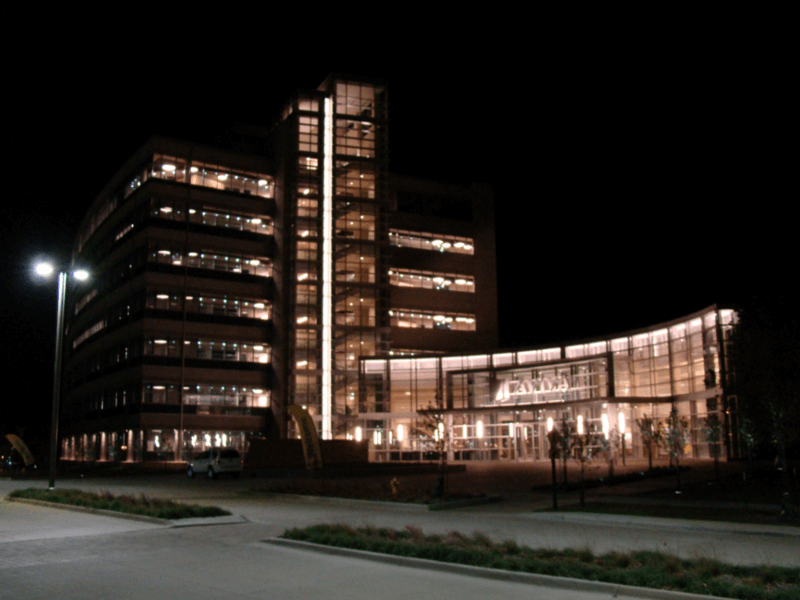 AVANT ACOUSTICS can help with both the acoustical and sound masking considerations in your healthcare facility. The situations described above are just a few of the most common spaces that benefit from sound masking design. If your facility requires speech privacy and/or has a persistent noise problem, let’s talk about your sound masking project today! 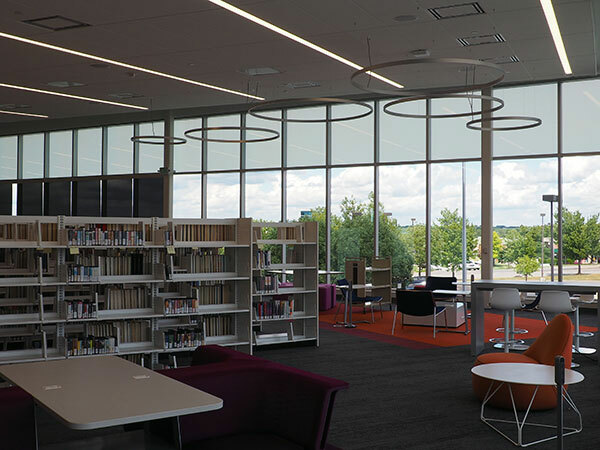 This two-story, 30,467-square-foot library has floor-to-ceiling glass along three sides of the building. Its interior incorporates flexible walls so that spaces can be adapted to meet a multitude of needs. 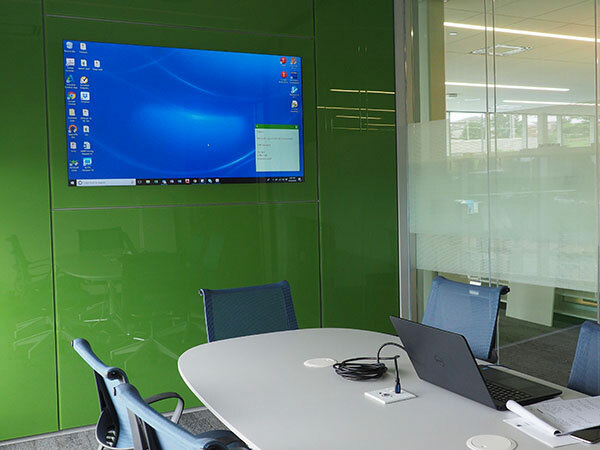 AVANT ACOUSTICS designed the building-wide paging system, study room video collaboration system, and meeting room presentation systems. AVANT also consulted on the room acoustics and mechanical noise control. 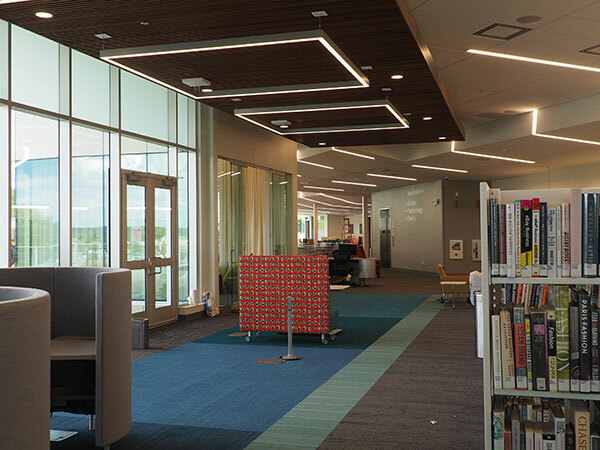 In addition to the audio-visual systems in the library’s public spaces, AVANT also designed a noise masking system for the open office staff areas behind the scenes. 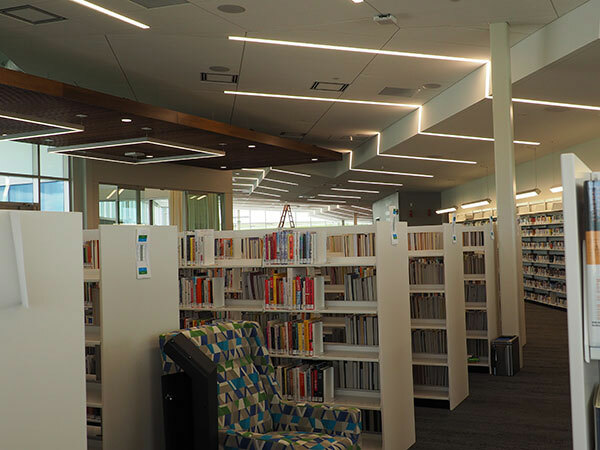 AVANT’s full system commissioning ensured that the systems performed their best and that all of the Library’s needs were met. 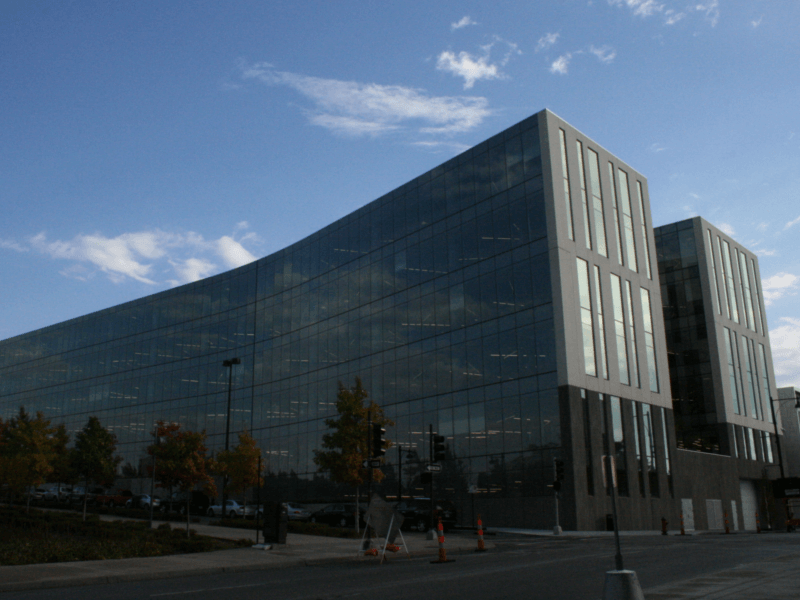 The Athene USA offices include an 8-story tower and adjoining commons building which houses 1,300 employees and cost over $150 million. The facility sits on an 88-acre site on the outskirts of the city, and features extensive outdoor pathways and several ponds. 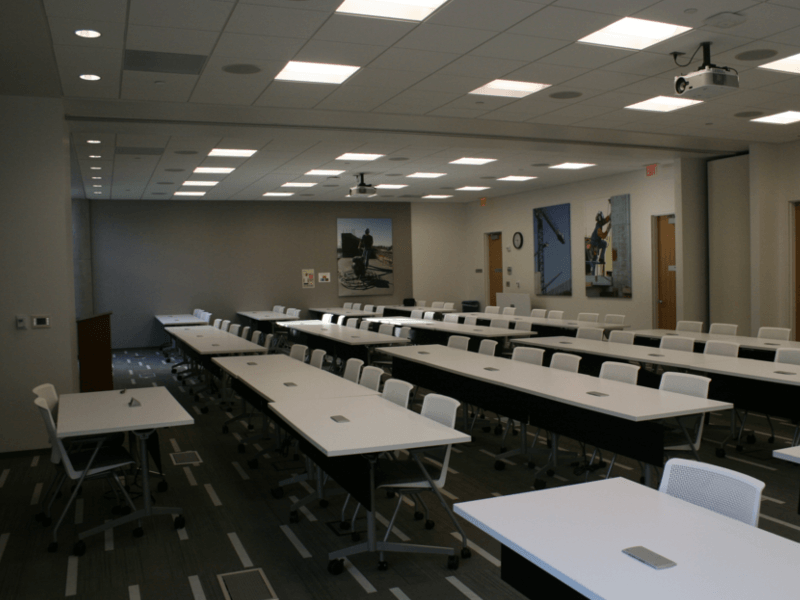 AVANT ACOUSTICS’ design included several multi-configuration training rooms, dozens of conference rooms, a building-wide room scheduling and maintenance system to serve the meeting spaces, a digital signage system throughout the facility, and sound masking on all seven floors of open work/collaboration areas. 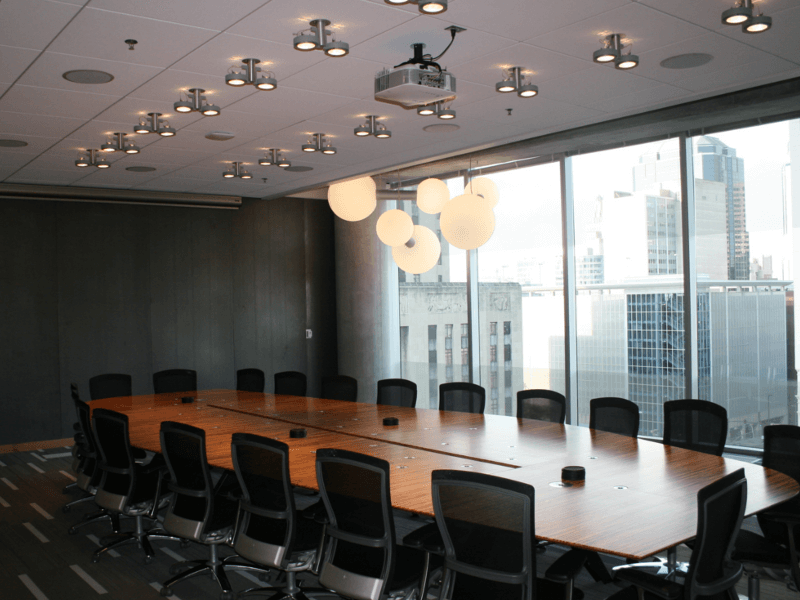 The executive boardroom features a large rear projection screen and teleconferencing. 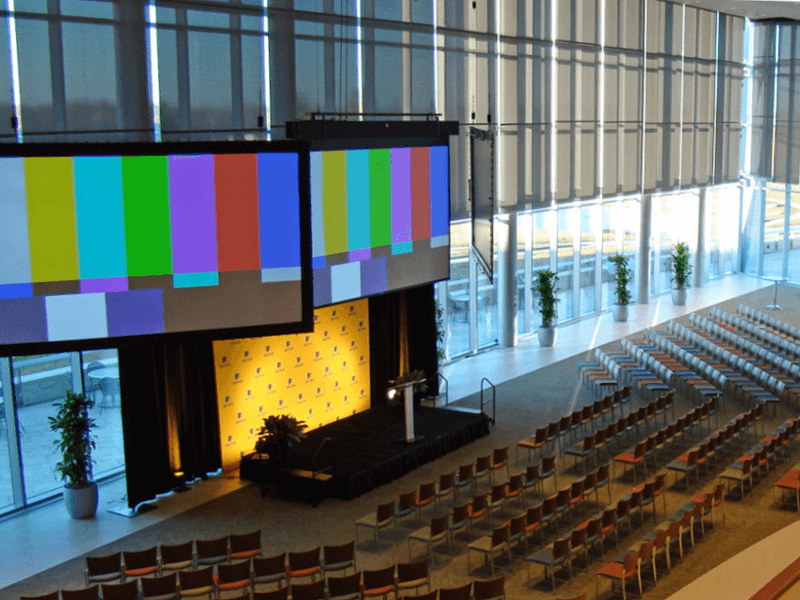 The “All Hands” system pictured includes three projection screens with production-level video processing capability and live audio mixing. 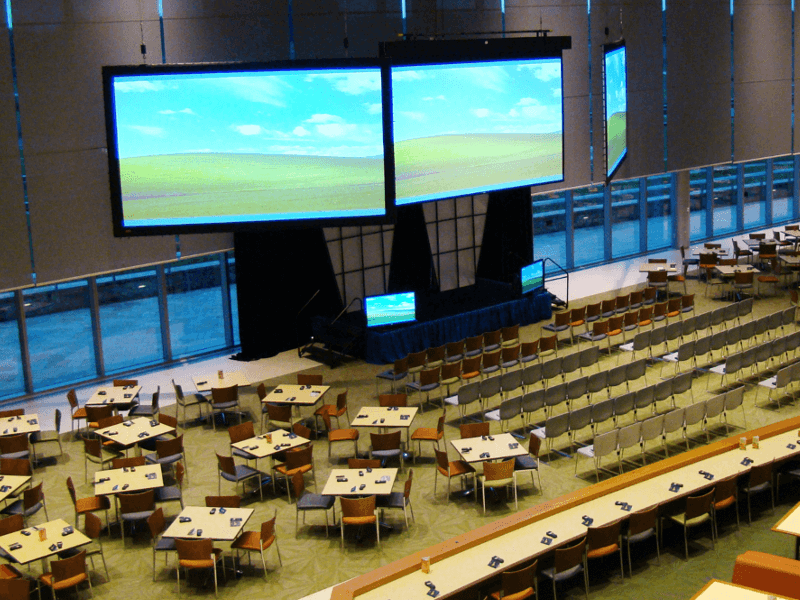 This system enables the client to host large meetings and events in-house, rather than renting out spaces and AV equipment several times a year. Mosaic Life Care’s urgent care facility in St. Joseph, Missouri, provides care and treatment of immediate medical issues, including illness and injury. At this Mosaic Life Care facility, noise was being transmitted from the recovery area to the nursing station. In addition to disturbing work, the lack of speech privacy in the recovery area created HIPAA concerns. AVANT ACOUSTIC conducted a thorough evaluation of the spaces. 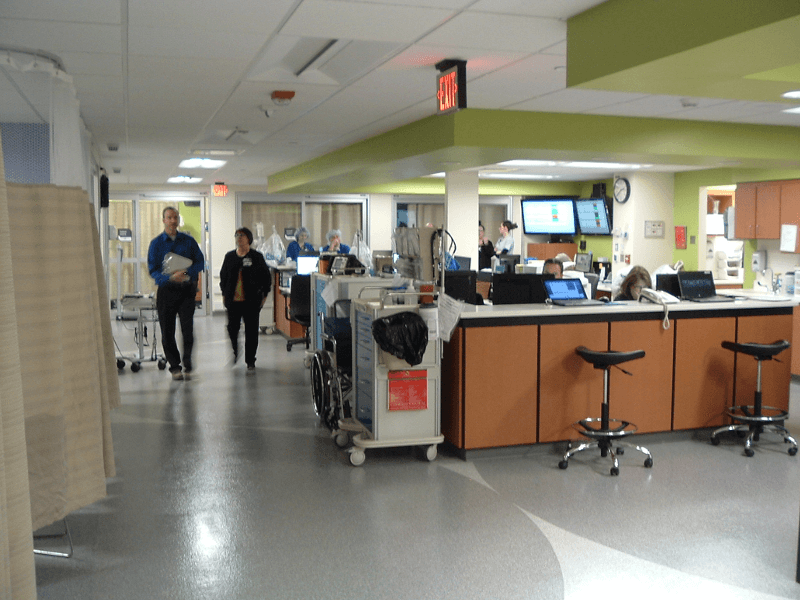 AVANT recommended ceiling tile replacement, installing sound-absorbing wall panels, and strategically placing glass panels to “acoustically” separate the nursing station from the surrounding patient areas. The glass panels would act as sound barriers, and create a sound-reflective surface to bounce sound back within the nursing station, solving the noise issues in these spaces.